To the east of Injeongjeon is Seonjeongjeon (Hangeul: 선정전; Hanja: 宣政殿), a building that was used by the king to discuss state affairs with government officials. 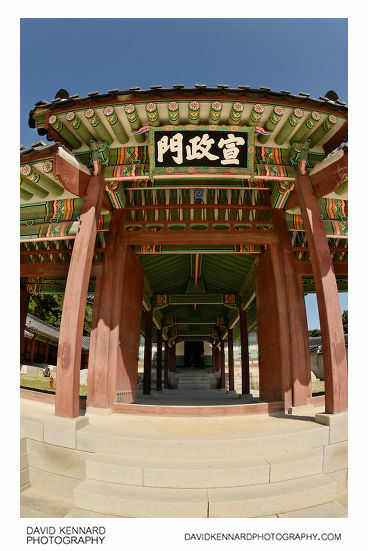 The above photo is of Seonjeongmun (Hangeul: 선정문; Hanja: 宣政門), the gate that allows entrance to the Seonjeongjeon area. Through the gate is a passageway that leads up to Seonjeongjeon, and I took a panorama underneath this corridor (360 version here). The passage is called Bokdogak (Hangeul: 복도각; Hanja: 複道閣). Seonjeongjeon was used as a shrine for part of its life, holding the ancestral tablets of deceased kings and queens. The corridor is today the only remaining evidence of its function as a royal shrine. 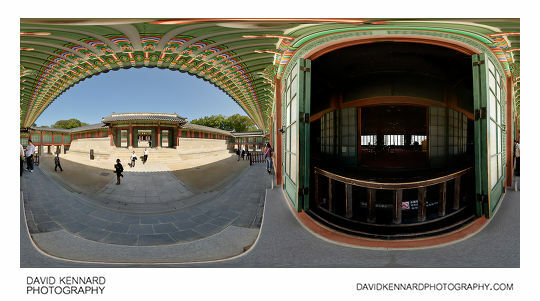 Next I took a panorama outside the main gate of Huijeongdang (360 version here). 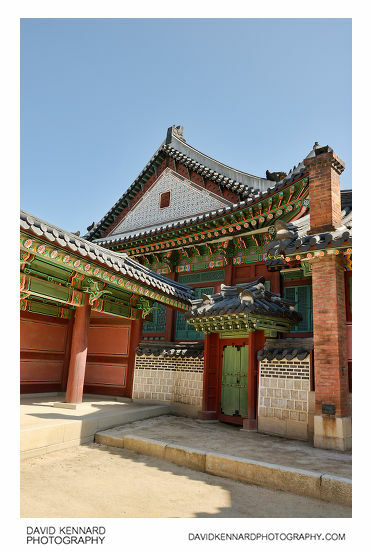 Huijeongdang (Hangeul: 희정당; Hanja: 熙政堂) was originally the king’s bed chamber, but was later used as the king’s main adminstrative office. The main front porch was designed so that a cart (and later a car) could be stopped under the porch. On the roof of one of the buildings enclosing the Huijeongdang area there were some Japsang (Hangeul: 잡상; Hanja: 雜像). These are small figures that were placed on the sloping roof ridges of important buildings. The figures are based on characters from the classic Chinese story Journey To The West (Hangeul: 서유기; Hanja: 西遊記). 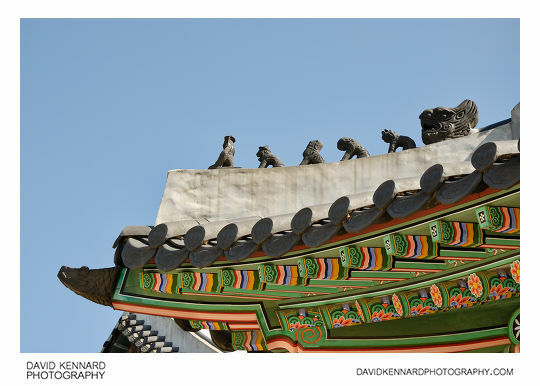 The more japsang a building has on its roof ridges, the more important the building is. This is the western side of Huijeongdang, and you can see there is a small gate here to access the Huijeongdang area. Many areas in the palace have one large gate, and then smaller gates like the one here to allow access from other areas. 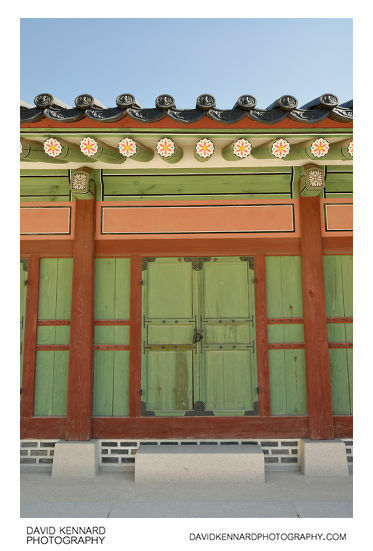 The above photo is some doors on an auxiliary building to the west of Huijeongdang, in the area behind Seonjeongjeon. 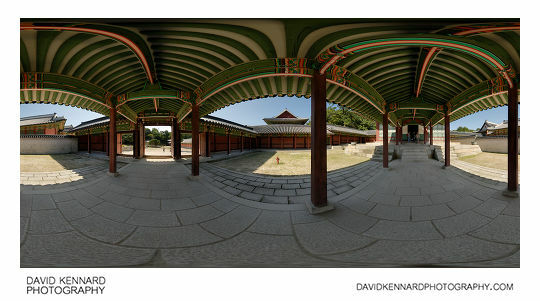 I took another panorama (360 version) behind Huijeongdang (the front courtyard of Huijeongdang is off limits to visitors). The large majority of my photos are bracketed ±1EV, then blended together in Photoshop to increase dynamic range and avoid images with too much blown highlights or blocked up shadows. However, for this image I had to take two sets of bracketed images, to keep details outside while still keeping some details inside the building. And even then, there are still areas of blown out highlights outside, and inside the building still looks very dark. 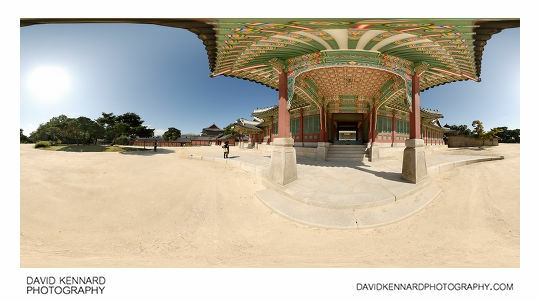 Huijeongdang was destroyed by fire in 1917, and the current building was rebuilt using materials from Gangnyeonjeon, the king's residence at Gyeongbokgung palace. The original building of Huijeongdang was quite different, with a raised floor set on stone columns, and a pond in the courtyard. The interior has western style wooden floorboards and carpets, glass windows, and chandeliers, along with western style furniture.